By David John Hopper and Dale Jewitt. There’s an unwritten rule that among those who put together pantomimes, and/or shows with children as the intended audience. Never Patronise the Audience. The plots might be outlandish, the sets may be saturated with colour and the characters may be so much larger than life that there wasn’t a fourth wall to break in the first place. But whatever you do, don’t patronise your audience- regardless of how old - or how young they are. Pantomime is one of this country’s oldest genres, and for many people is also their first exposure to the theatre. It’s a perfect start too. Children have a sense of logic that transcends all of the wackiness that is provided by such a show, thus a good, and straightforward story is necessary to have them hooked. Their responses are obvious too, and there’s no holding back with them. Since the children are with their Parents, Grandparents, Aunties, Uncles and Guardians, there needs to be something to entertain them too, because if they see that the Adults are having fun, then they will have fun too. So, the pressure was on for the team behind Puddles Adventure, on this week at the Customs House for the Half Term Break, to put on a good pantomime for the younger children, and to live up to those traditions. Simply put. Yes. Very much so. The plot is actually quite intricate, but straightforward enough to ensure the trip home is not overloaded with questions about the plot. Set in Cooksonville- the setting for all of The Customs House Pantomimes, the story sees each incarnation of the town broken up and mashed together so that the Evil Fleshcreep can rule over all. It’s a helpfully convenient plot, to allow characters from the more recent pantomimes return, and interact with the lynchpin character of Arbuthnot, as well as having one more breath of life on the stage. Written by David John Hopper, who also directed and returned with ease to his staple role of the lovable Arbuthnot, and Dale Jewitt who is taking over the role of Puddles, the plot is more akin to an episode of Doctor Who (indeed a rock version of the theme tune makes an appearance) or a Comic Book Multiverse Story Arc, a Crisis on Multiple Cooksonvilles. But it really does work to bring back old friends and give our heroes something unique to really struggle with. There are no strangers to this form here: David John Hopper is always a welcome sight to the Customs House stage, especially in his Arbuthnot character. Kids love him, and rightfully so. 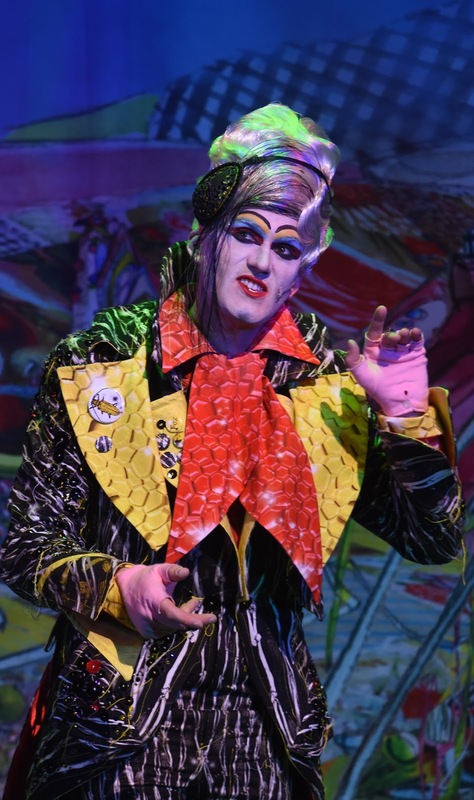 It is in the opinion of this reviewer, having not long taken off the panto dress and heels, that within a panto structure, the Dame is for the Audience and her Knockabout Son is for the Kids. There’s nothing lost by not having his stage mam of Dame Bella, or any Panto Dame, in this story, as that particular dynamic is more suited to older audiences. But Arbuthnot is not alone. The dynamic between David John Hopper and Dale Jewitt is energetic and fun and makes for a wonderful combination that the audience is always a part of. Jewitt takes over as Puddles, a character from The Lambton Worm, and while he kept both the accent and the general look, with a clever alteration to the mouthpiece, allowing more freedom to speak, he really makes the pooch a little more cerebral. Previous to this, he was part of the NE6 Panto debut on the north side of the River. Representing Red Riding Hood once again is the character of Chorizo, our Spanish Piggy who is once again played by Kylie Ann Ford. This role was a show-stealer for me the first time around, and is back on form this time around too, a dynamic performance that has an audience hanging on to each word- and karate chop. Not long back from a Touring Pantomime of Aladdin, it was great to see her back on the Customs House Stage. Then there is Mr. Nasty Himself, Craig Reve- sorry, Fleshcreep, played by Steven Hamilton once more. Hamilton relishes and shines in every role he plays. A good story is only as good as it’s antagonist, and this one is as superb as ever, with every aspect of his performance very precise. As always, the ever-talented and great South Tyneside Dance Workshop are back performing the dance routines with gusto- and they’re headed up by Katie Reed and Lori Smedley providing a link to the Audience as go-between citizens of Cooksonville. 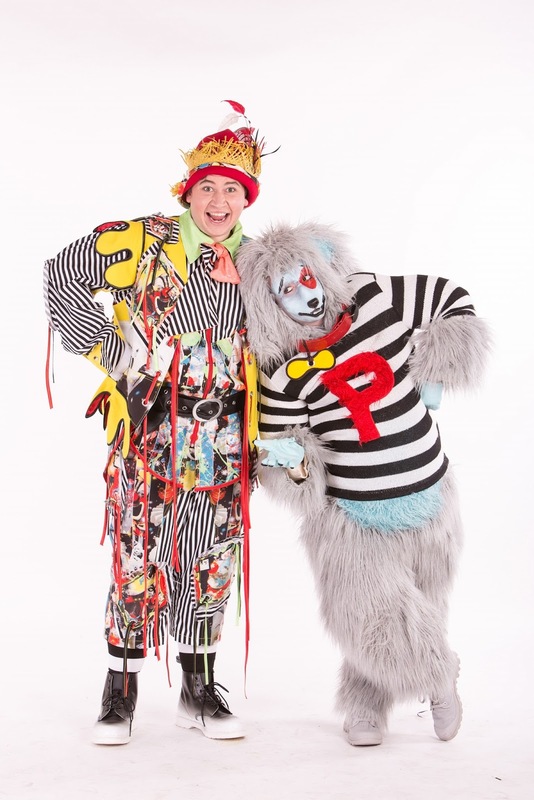 The line of experience continues with these two as well, having both just finished a sell out run at the Pier Pavilion Pantomime of Aladdin in January and bring a wonderful and endearing energy to this show. Let’s not forget the Mayor of All Cooksonvilles Gareth Hunter who lends his voice to move the story along- in a way that sounds very natural, and appropriately played. It looks and sounds good too, as the aesthetic continues on from previous years- having become in many ways the Customs House look. There was not one second where this team forgot to take their audience seriously. It was a tight, smart and- above all, an appropriately fun show. & South Tyneside Dance Workshop.